Dressing for spring in Chicago can sometimes be a challenge! We never really know if we will have a true spring. More often than not we have inconsistent weather days-mild and warm one day, plunging temperatures and rain the next! That is why transitioning from winter to spring wardrobe can be tricky. Yet I try to put away the winter coat, heavy sweaters, and snow boots this time of year and instead opt for transitional layering pieces in soft neutrals. 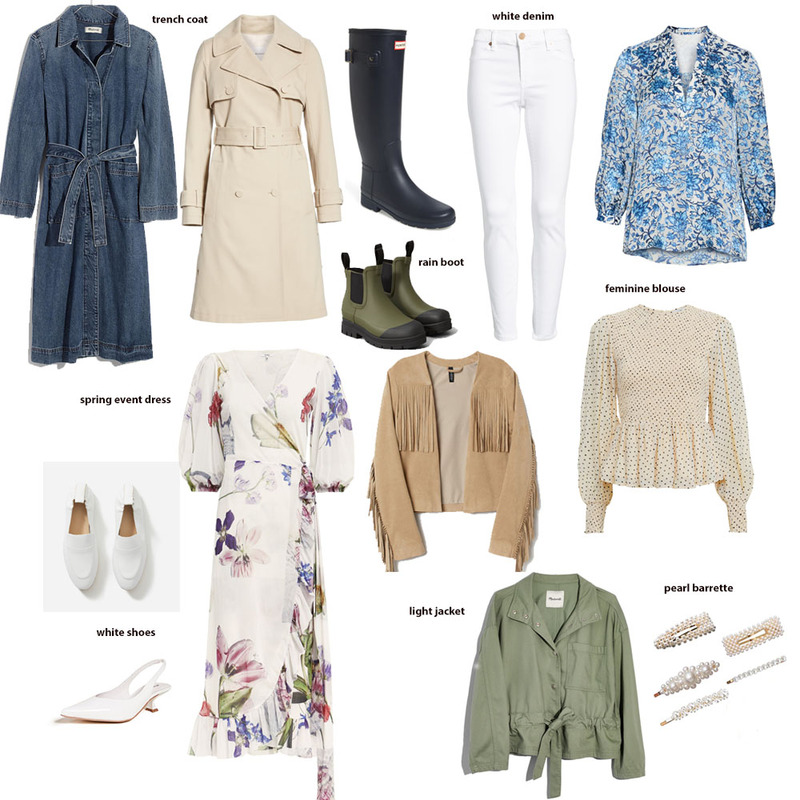 Keeping in line with a capsule wardrobe format, I am sharing my favorite spring wardrobe essentials for the season. You will find in this round-up repeat basics that I just cannot get enough of, along with some new additions that work well into your everyday staples. While we might be able to put away our down coat, we still need to have plenty of other coats on hand to carry us through spring. And a trench coat is a spring wardrobe staple must have! I love wearing one with a basic white t-shirt, a pair of jeans and sneakers or thrown on over a flowy dress with a pair of Hunter rain boots. It obviously serves well on those rainy days and layers well with a knit sweater on the cooler ones. This season I am seeing so many fun twists on the traditional trench! In the past, I have relied on my Hunter boots to take me through the spring season. And I still love to wear them this time of year! However, I found the perfect pair of shorter rain boots that I have been living in so far. What I love most about these ones from Everlane is that I can wear a thick sock with them on colder days. They are also extremely comfortable and lightweight! Denim is a wardrobe staple in every season! For spring, I absolutely pull out the white denim. I am sharing this pair again because I am in love with them! They are just the right amount of skinny without feeling like they are painted on you! They look great paired with Hunter boots, a denim jacket and a cashmere scarf this time of year. A cropped skinny pair of denim is another good choice. I love them paired with slingbacks or ballet flats. An alternative to denim for this look are these wide leg chino cropped chinos or straight leg crop pants. A lighter denim wash and fabric is also nice to have on hand. I have been living in these high waisted skinnies paired with sneakers. Nothing completes a spring outfit like a floral blouse. Tuck into a midi skirt and add a pair of slingbacks with a leather jacket and you have the perfect day to night look! I am seeing a ton of other beautiful, feminine blouses this season. Silk, polka dot, or lace come to mind, all being beautiful blouse options to add to your spring wardrobe! Confirmations, graduations, benefit luncheons, weddings and Mother’s Day brunch. In no other season is there more of a need for a dress than spring. I usually gravitate towards a midi length in a solid color but there are so many pretty options in lace and floral dresses as well! Beyond the trench coat, leather, suede and denim jackets in lighter colors are all good options for spring. A short parka jacket is also a good idea! They can be the perfect final layering piece to add to a spring outfit! And after wearing my down coat non-stop for the past five months, I love to change up a basic look up with a few fun jackets. I love a white leather shoe for spring. The two that I have added to my closet this year are this loafer and this slingback. Two spring uniforms come to mind with a white shoe: a white leather slingback, cropped denim, a feminine blouse and a trench coat or a white leather loafer, skinny denim, short sleeve white t-shirt and light suede jacket! Yes it is a trend, which I am trying to limit adding to my wardrobe, BUT this one is a must! Layering pearl barrettes in your hair is taking over the fashion world right now and I could not be happier about it! Feminine, french, Chanel inspired, it is the perfect accessory to dress up any look this spring! And the best part about it? I found a package of five of them for just $10 on Amazon! *Note that if you are shopping for spring wardrobe essentials, Shopbop just kicked off one of their epic sales today with up to 25% off your order!